Recently I had upgraded my PC with new graphics card, as wanted to play some of the latest games and saved me having to get either PS4 or Xbox one. Though after upgrading both the video card and the psu to handle the new card, the temperature in my mid tower case went through the roof, mainly as not got enough air flow as the case had no fans on either the front or side so got some fans, though this meant the noise level want up. My main PC is in the living room and is on most of the time as acts as a media server, so the extra noise was too much and the older motherboard I have doesn’t controller the speed of case fans to lower the noise. For this you can get a speed controller and display that fits in your 5-1/4 drive bay which are available from the likes of Amazon or eBay for around £10. So I ordered one of these. The unit can control upto 3 separate fans that either have the 3 or 4 pin connectors. 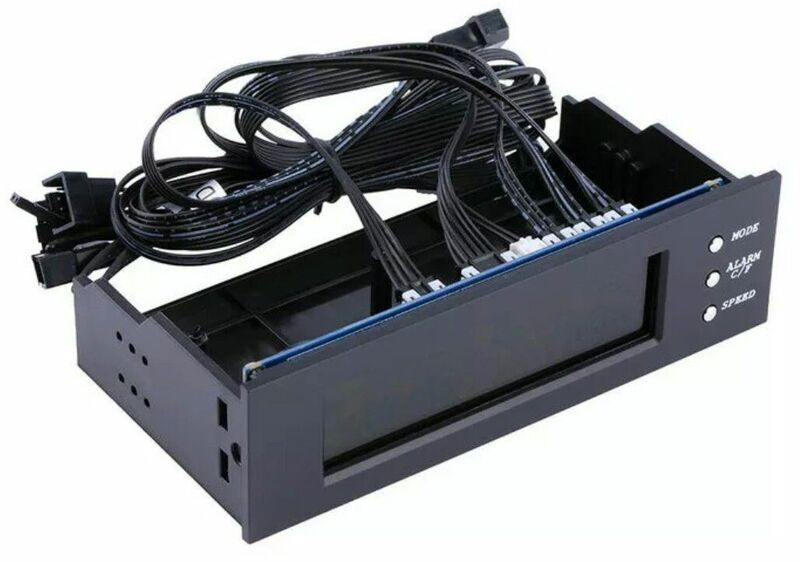 The unit is powered by a standard 4 pin molex connect though no through power. On the back of the unit if your cables are long enough you can connect your fans direct or it does come with extension cables. You do also have three temperature sensors. To get the best results from the temperature sensors you need to place them as close to the part you want to monitor, so ie for your cpu, put towards the bottom of the heats ink and try to touch the cpu, or even on the back of the motherboard under the cpu. For me I have put the sensors by the cpu, on the hard drive and used a bit of installation tape to hold on the top of the harddrive, the gpu put within the heats ink cover and by heatsink. Using software like HWMonitor that show the template of each of the devices the temperature sensors I get about about 10% difference. So not perfect but does give u a visual idea of the temperatures on the front of your pc within opening up software. The unit does have a large system, now the manual isn’t that good so not fully sure how to get this working fully. The manual does say can adjust the fans automatically depending on the temperature, I assume this is to do with the alarm function but not got it working as, when reaches a certain temp the unit just beeps. I can’t really use this function as when the alarm goes off the dog goes mad barking at the pc, as she mustn’t like the sound. Though I have found it easy enough just turning up the fans manually when playing games, for normal use I can just about have on the lowest setting, then when loading a game just use the mode button to select the desired fan, then press the speed button to turn it up. For me this unit solves the problem of adjusting the fans at the moment unit I upgrade my whole pc later this year, though think even if the new motherboard does control the case fans will still use this unit just for the temperature readout. The value of these units is great as well for about a tenner not bad. There are others that have dial controls to fully control the speed and ones with card readers in aswell and these are about £20.